Smells like 10. - A Life From Scratch. Oh my. 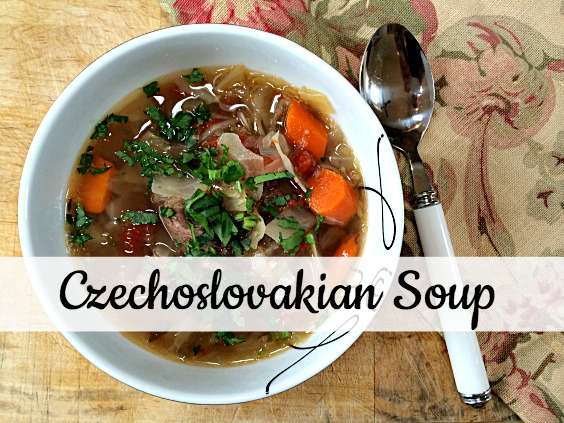 Does this Czechoslovakian Soup recipe bring back memories. I love when a smell jolts you back a few decades to the happy and carefree time of being 10, when the only worries in the world were Friday spelling tests and who to play with at recess. I’d get off the bus, run home, and be oh so happy when this smell (and my sisters) greeted me at the door. It’s unlike any other. What can I say? Even at 10 I. liked. to. eat. Give me the beef bones, the short ribs, the softened carrots, the perfectly browned dumplings on the side. I wanted it all. 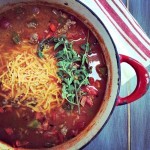 This passed down recipe came from one of my mom’s friends, and it’s as authentic as they come. 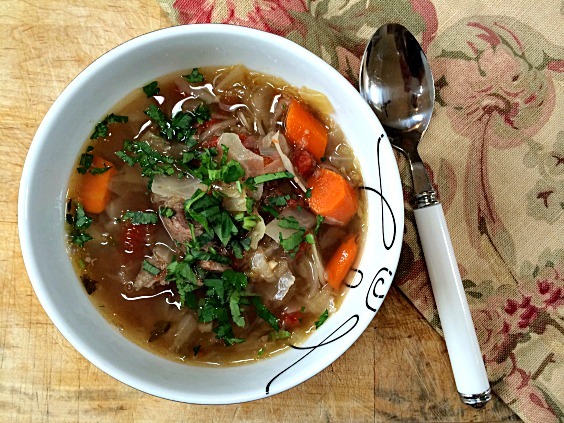 The coolest part of this recipe, at least to me, is using all the beef bones. I love all that stuff – the meatier and bonier, the better. You throw them all in a big tray with some spices and veggies and roast away until softened and tender. After that all that flavor is scraped along with the other ingredients to simmer away the day in a big pot. 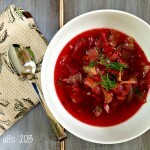 As far as rich and flavorful soups go, aside from the roasting and the simmering there isn’t all that much to this one. It comes together beautifully and will last all week. That is, if you don’t eat it all right away. Place beef bones, onion, carrots, garlic, and bay leaf in roasting pan. Top with short ribs. Sprinkle with thyme and paprika and roast uncovered at 425 degrees for 25 minutes. Transfer meat and vegetables into a large pot, scarping the browned meat bits from bottom. Add water, cabbage, tomatoes, salt and tabasco and bring to a boil. Cover and let simmer 1 1/2 hours. Skim off the fat from the surface. Add parsley, lemon juice, sugar, and sauerkraut. Cook uncovered another hour. 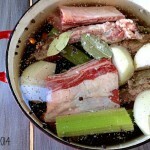 Remove beef bones and short ribs from pot. Once cooled, remove meat and return to the pot. Discard the bones. Simmer low until dinner, adjusting the seasonings as needed. I love the flavor of beef bones. Sadly both my brother and sister have an aversion to meat on the bones – how the hell did that happen when we grew up in the same house??!! They can’t eat chicken wings, pork ribs, bone in chicken breasts – such a waste because the meat is so much more flavorful on the bone. Short ribs and sauerkraut? 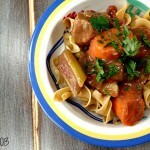 My German heart is loving this recipe!! Homemade soup is the best, and this looks so good! Thank you Heather! I hope you enjoy if you make it! I love a good soup recipe and this is unlike any I’ve seen before. I’ll have to give it a try. I’m visiting from nifty thrifty Sunday. Handed down recipes are the best! This looks awesome.